Today I did a quick Facebook Live Video to discuss something that is really ticking me off lately. Let me be clear – just because you have updated beneficiary designations does NOT mean you have a good estate plan in place! Full Transcript – Why Beneficiary Designations do NOT count as Estate Planning! Hey there, Jim Hart here from the Hart Law Firm and I thought I would do a quick video today outside because it’s a beautiful day here in North Carolina. It’s in the 60’s, mid 60’s degrees outside. It’s beautiful and today I wanted to talk to you about why beneficiary designations are NOT an estate plan. And I get this from clients all the time. I’ll be honest it pisses me off a little bit. In fact I had a client that was supposed to come in a week or two ago and they called me or I called, typically what I do is my process is I’ll send you out, if you want to come in and meet with me I’ll send you out a bunch of information and then I ask my clients to return that information to me before they come in so I can understand what their situation is and customize the presentation for them. So I like to know a little bit about the prospect before they come in and meet with me. Now typically what I’ll do is after I mail that out I will follow up with them about a week before the meeting if I haven’t received the documents back to see did they receive it, do they have any questions, anything I can help them with to fill it out, and so I did that with a potential client and basically they said we’ve gone through this, this is really more than we need and we’ve already got a lot of our beneficiary designations in place so we really don’t need this. Now there’s a lot of reasons why people decide not to hire an estate planning attorney or not to move forward with the process. 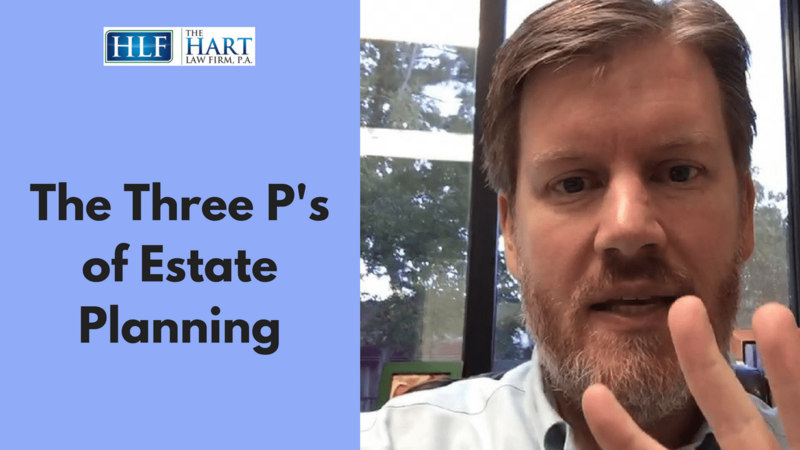 It could be they’re scared of the process, it could be they don’t want to deal with the cost of the process, it could be that they’re just overwhelmed by what it’s gonna take to finalize an estate plan. And those are all legitimate reasons to maybe not move forward. Now they’re not good reasons to not move forward because everybody needs an estate plan. But those are understandable reasons. But when somebody tells me “we’ve got our beneficiary designations in place so we do not need an estate plan because we’ve already got it taken care of,” that to me says they don’t really understand what an estate plan does. 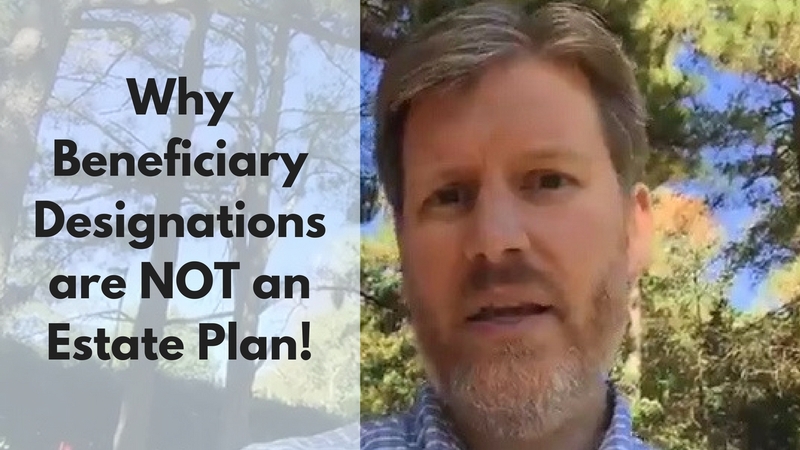 And so I thought I would take a minute today to explain why just having beneficiary designations in place is not an estate plan. And that’s not a good alternative to doing your estate plan. And there’s a lot of reasons. Number one probably one of the biggest reasons is one of the things we do with estate planning is we don’t just plan for what happens if somebody dies. Everyone thinks “well this is what happens when somebody dies, so my money’s gonna transfer, it’s gonna be out of probate, no issue there, we don’t need to worry about it.” But that is only part of the equation. The other part of the equation which is far more frequent is what happens if somebody becomes incapacitated? Beneficiary designations will do nothing in that situation. Beneficiary designations will do nothing in that situation. If somebody becomes incapacitated, that money that’s in their accounts whether it be retirement accounts or investment accounts or their bank account is, it’s going to be basically locked up if you don’t have an estate plan in place to deal with that or you have named somebody to manage that money, those funds for you. That money is gonna be locked up and you’re not going to be able to do anything with that. So that is the first big problem of beneficiary designations is they don’t do anything when it comes to times of incapacity. Another reason why beneficiary designations are no good is because a lot of people leave their money through the beneficiary designations to either their spouse which is fine, but then they also leave their children as contingent beneficiaries and if their children are minor children, this is a problem because basically, they’re setting up a huge expensive court process for their children to deal with that money if they inherit it. And then assuming there’s money left over when the child turns 18, if there’s anything left over that money is turned over free and clear to the child to do with as they want with no restrictions, no oversight, nothing at all that the child just gets that money then and that’s it. Who knows what they’re going to do with it. Let’s see, so what have we touched on. 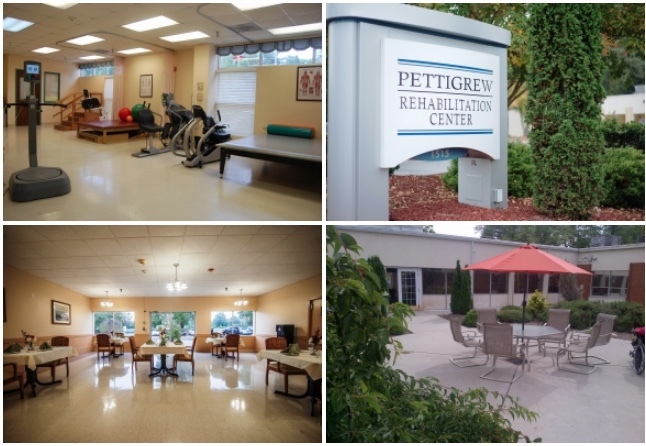 Incapacity planning, beneficiary or minor children. Taxes can be an issue, it’s not a huge issue because for most people estate taxes are not a huge issue. So that’s not the main concern, but I would say those two are the big two and oh, shoot I’m blanking. There was a third that I want to talk about today. I may think about it here in just a second but those are the main two. So it’s not going to do anything when it comes to incapacity planning and oh I guess that would be the other thing. If you have children and even if they’re not minor children you’re going to leave money to them through incapacity point or through your beneficiary designation. The big problem there is there is no oversight over that. That you’re not protecting that money in any way shape or form, so if you’re leaving it to minor children it’s going straight to the minor children, no oversight there, no asset protection there. If they’ve got creditors or if they need to declare bankruptcy or anything like that, excuse me, no protection. No creditor or protection from anything like that. Bankruptcy, divorce, et cetera. That money is there, left to them and it could be lost. The second main concern is when it comes to blended families, so if you leave that money outright to your spouse, you’re not providing any type of protection if your spouse gets remarried and then something happens to them. The money could go to their new spouse and or potentially stepchildren without with your children being completely cut out and we’ve seen cases where that happens quite frequently. So those are the big three things I would say are, it doesn’t protect in the event of incapacity, it doesn’t protect if you leave the money to your minor children and then finally it offers absolutely no protection from creditors, from bankruptcy, from divorce, from lawsuits, from anything like that. And then kind of the bonus is there it doesn’t protect in the event of a blended family situation. So you know it’s, this is one of the reasons why I like to bring people in and meet with me and talk about this because they don’t understand that these are all potential problems when you’re just using beneficiary designations. They are a wonderful tool to avoid probate and things like that, but that is not typically the biggest issue that a lot of my clients face. Beneficiary designations do not equal an estate plan. That’s the biggest thing I want you to take away from this and if you have any questions, feel free to give me a call at 919-883-4861 we’d be happy to help you anyway if you’re in Wake County or Cary North Carolina that’s where our office is located and have a great day and I will come back with another video here later this week. Take care folks, bye bye.